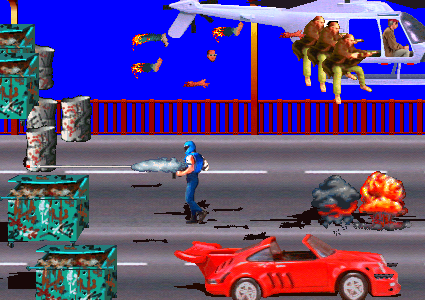 Last week at GameSetWatch, I wrote about a new Spanish fan translation for Namco’s light gun shooter Time Crisis. Along with translated text, it features rerecorded dialog that required the efforts of seven different voice actors. It’s remarkably well-done, especially when considering that dubbing is rarely attempted in amateur game translations. Below is a previous experiment in fan dubbing. “Vocals of Phantasia” was a translation patch released for Namco’s Super Nintendo RPG Tales of Phantasia several years back. The intro’s pretty funny (is she singing words? ), but skip to 2:07 for the best part. Trust me, you need to hear this. Nintendo of America tried to outclass Vocals of Phantasia with its own dub, released for the Game Boy Advance in 2006. Amazingly, it succeeded. It succeeded in the best possible way.